-- Select a Size -- 10 inch 12 inch - Out of Stock! 14 inch 16 inch 18 inch 20 inch - Coming Soon! 22 inch 24 inch 26 inch - Out of Stock! Your dog will be fully prepared for your outdoor activities with the Hurtta Extreme Warmer Dog Jacket in Coral Camo! The Hurtta Extreme Warmer Dog Jacket is perfect for keeping your dog warm in the coldest conditions. 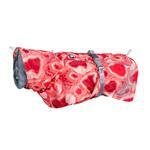 The foil liner inside reflects your dog's body heat and provides significant warmth. The outer material is not only breathable but also water-resistant. The high visibility 3M reflectors will keep your pup visible and safe even in the dark. Besides a high collar, this jacket has a warming tricot hood that can be lifted to protect your dog's ears and head. With adjustable back length, collar and waist, and a protective rear hem, this highly technical outfit is suitable for a range of applications. The leash hole on the back allows for easy attachment. Posted On 02/22/19 by Mary L P from Chicago, IL Yes, Mary L P recommends this product! I have been buying Hurtta Jackets for my dog ever since we bought her. Because she’s an inside dog, I wanted something that would really keep her warm. The Hurtta Extreme Warmer jacket Not only is warm and attractive but is also well-made. The silver lining reflects her body heat right back at her to keep her warm and, unlike I other brands, Hurtta put special flaps that cover her entire stomach and hind quarters… Keeping all the muscle groups warm. There are cheaper coats on the market… But you get what you pay for. Anything made by Hurtta is well worth the money that you pay. And did I mention… They Are washable and last a long time. BaxterBoo is a wonderful place to shop for my Cocker Spaniel! I no longer look for doggy apparel in pet stores as I prefer to get my Cocker's clothing from BaxterBoo! I love the quality of their items, the sales and the many chances to get free shipping. God bless the people behind this awesome company!